Just because this e-book is short (approximately 60 pages) does not mean that it is simplistic or not weighty. This treatment by Craig packs a wallop. At the outset Craig lays out the outline or skeleton for his cogent articulation and reasoning for the existence of God thus: “A good argument must obey the rules of logic; express true premises; and have premises more plausible than their opposites.” Put simply, a good argument for the existence (or non-existence) of God must meet three conditions: (1) obey the rules of logic; (2) its premises must be true (correspond with reality); (3) have premises that are more plausible than their opposites. Craig begins with the Cosmological argument for the existence of God in by developing the following formulation: (1) Everything that exists has an explanation of its existence, either in the necessity of its own nature or in an external cause. (2) If the universe has an explanation of its existence, that explanation is God. (3) The universe exists. (4) Therefore, the explanation of the universe’s existence is God. He then gives philosophical and scientific evidence demonstrating that the existence of a God that is a necessary, uncaused, timeless, spaceless, immaterial, personal Creator of the universes makes more logical sense than the plausibility of His non-existence given by atheistic philosophers and scientists. The third argument developed by Craig is the Teleological or Fine-tuning formulation: (1) The fine-tuning of the universe is due to physical necessity, chance, or design. (2) It is not due to physical necessity or chance. (3) Therefore, it is due to design. Here Craig tackles Richard Dawkins central argument from his book “The God Delusion” head on and proceeds to tackle his seven objections one at a time. Craig carefully dismantles Dawkins objections and gives a very plausible defense of the argument of design as a reasonable explanation for God’s existence. Craig’s last argument is based on the classic Ontological argument as espoused by St. Anselm in the 11th century and in the modern era by the great theistic philosopher Alvin Plantinga: (1) It is possible that a maximally great being (God) exists. (2) If it is possible that a maximally great being exists, then a maximally great being exists in some possible world. (3) It a maximally great being exists in some possible world, then it exists in every possible world. (4) If a maximally great being exists in every possible world, then it exists in the actual world. (5) Therefore, a maximally great being exists in the actual world. (6) Therefore, a maximally great being exists. (7) Therefore, God exists. Taken together the five arguments developed by Craig make a compelling case for the existence of God – especially when compared with the counter arguments atheists give in their own apologetic of plausibility for God’s non-existence. 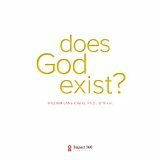 I highly recommend this clear and intellectually sound defense of the cogency of God’s existence as the best plausible argument for our own existence which brings purpose and meaning to one’s life through the culmination of God revelation in sending His Son Jesus so that through Him we can be reconciled and restored in a right relationship with Him by His grace and for His glory.